“Decades ago, [architect John] Portman never envisioned his buildings as dystopian fortresses or imagined Hollywood actors rappelling down his skyscrapers.” But Atlanta has become a popular filming location, and Portman and his neo-futuristic buildings are an important reason why. Tax incentives help, of course, but there’s something about the lines of Portman’s architecture that lures filmmakers looking to set a dystopian tone. Hays also believes filmmakers use architecture to represent societies that are forming or collapsing, and conceptual structures are too eccentric to symbolize the collective groups that dominate dystopian storylines. Portman’s work fits on film in part because his design philosophy straddles the modernism and brutalism handed down to his generation from predecessors such as Le Corbusier and Marcel Breuer, who strove to incorporate functionality and community into their buildings. Portman’s buildings—featuring his signature mix of modernism and brutalism, highlighted by massive atriums and long, glassy elevators—has appeared in dozens of movies over the last three decades, including Sharky’s Machine (1981), Grosse Pointe Blank (1997), and Mission Impossible III (2006). But more recently, they have also come to set the scene for Hollywood’s most popular dystopian thrillers, such as The Hunger Games and Divergent, not to mention TV’s The Walking Dead. Of course, Portman’s distinctive designs aren’t limited to Atlanta. Here’s a Warsaw, Poland hotel that looks perfectly suited to loom in the background of some YA-adapted tale about a bleak, yet neon-tinged future. 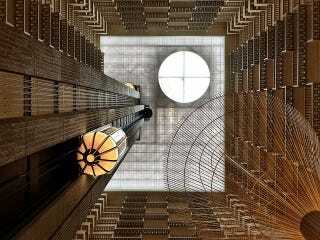 Top, interior photo of Atlanta’s Portman-designed Hyatt Regency by Flickr user Lee Coursey; bottom, photo of Warsaw’s Westin by Flickr user Dan.